This Kenmore Pro has some real cons. 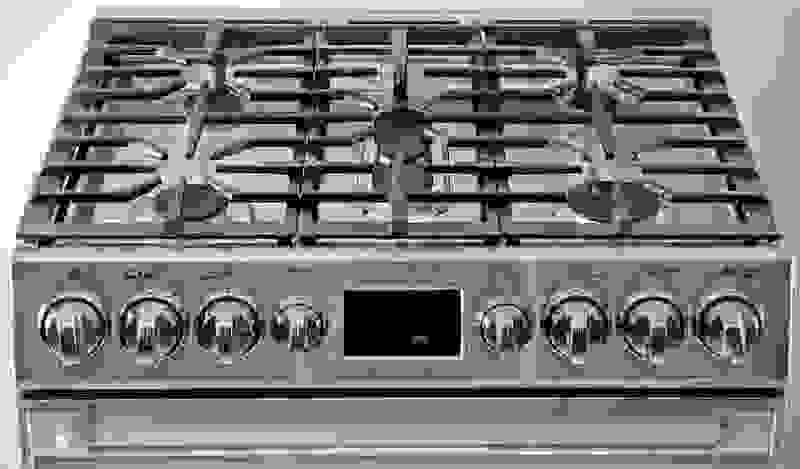 The Kenmore Pro 72583 (MSRP $2,899) gas range is part of the Kenmore Pro lineup. The Sears-exclusive kitchen suite debuted last year, and takes design cues from luxury appliances. Stainless steel exterior? Check. 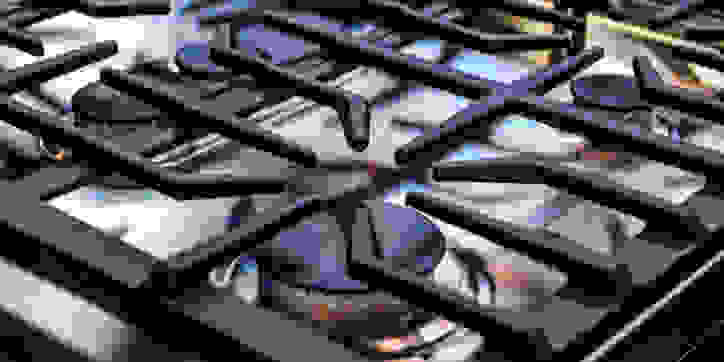 Heavy cast-iron grates? Check. Dials instead of buttons? Check. Rugged and solid appearance? Check. 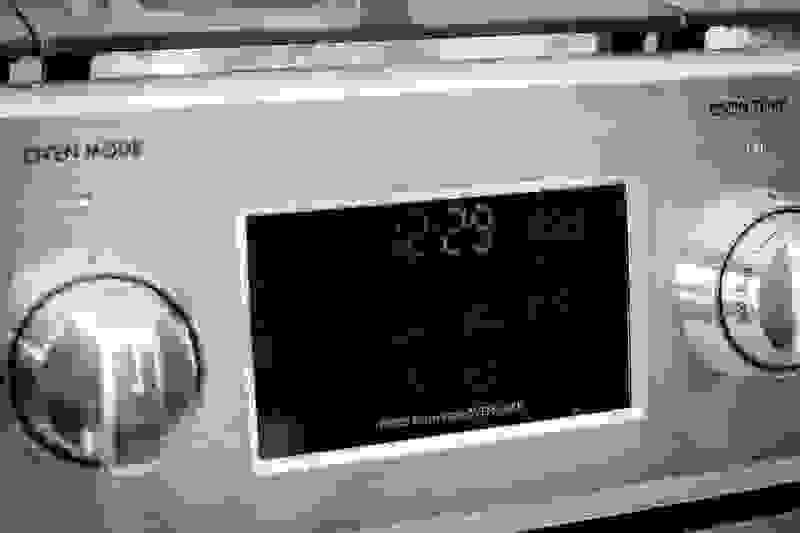 Under its high-end finish, however, this is an ordinary range built by Frigidaire. On sale, this Kenmore sometimes dips down to $1,999. That may be cheap for a Viking or a Wolf—but it's a lot for a mass-premium product. Is it worth it? After all, you can buy a perfectly good gas oven with true convection for under $1,200—and the Frigidaire FPGH3077RF this range is based on sells for just $1,799. That's why the pros at Reviewed.com put this Kenmore Pro through the same battery of tests we give every range we review. The rangetop features a couple of good burners, but they are unlikely to set the cooking world on fire. More troubling was the general unevenness of the 5.1-cubic-foot oven. Preheat speeds were slow and the broiler offered a very small area of coverage, while our food tests reveled a number of hot and cold spots in the oven, even when using the much touted true convection baking option. Although it might look great, we're skeptical of how good a value it is. In case the “Pro” in the name wasn’t enough of a hint, the 72583 mimics the appearance of a professional range. As befits the trappings of a prosumer range, it comes clad in stainless steel, has a set of heavy continuous cast-iron grates, and favors physical dials over touch screens—although the timer is controlled via a digital panel. Although it's a freestanding range, the 72583 has the outward look of a pricier slide-in but doesn't require any modifications to cabinets or countertops. While it may not be to everyone’s tastes, we think this range looks great. It also feels great to use: The dials are responsive, and the overall build quality feels better than most products in this price range. The 5.1-cubic-feet oven is large and features a true convection mode that combines a fan and a heating element to improve heat circulation in the oven. The rangetop is extremely spacious, with continuous cast iron grates that make moving heavy pots considerably easier. We had no trouble using several pots and pans at once. The range top features a total of five burners: four regular burners at each corner, and a center oval burner that comes with a griddle pan for breakfast fry-ups. The center oval burner is comprised of both inner and two outer gas elements that can be turned on and off independently. If you want to learn more about our extensive testing process, you can read our How We Test page for ovens. Can the 72583 live up to its Pro moniker? Our pros say this Kenmore needs a bit more training, but it’s by no means an amateur. The front right burner proved adept at bringing water to a rolling boil. 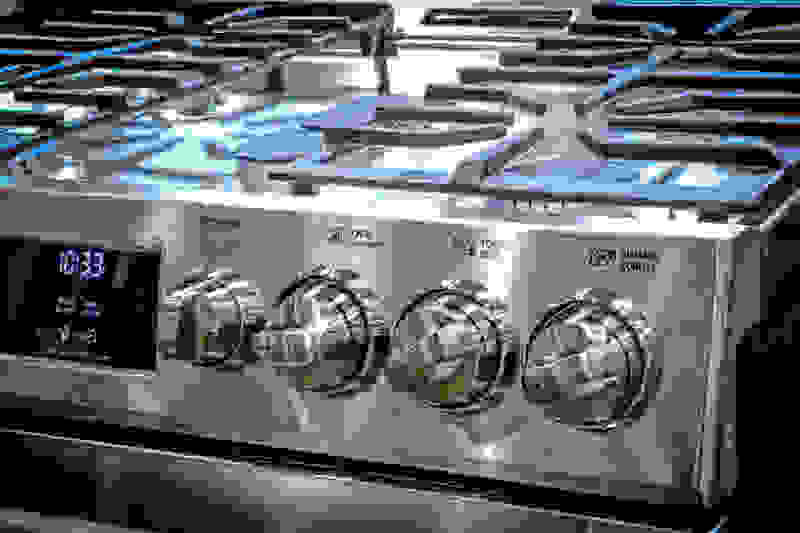 In our tests, it took only four and a half minutes to boil six cups of water—an exceptional result for gas ranges that tend to be slower than electric or induction. Meanwhile, the front left burner offered a wide range of temperatures, from 94°F to 375°F. That should cover all your simmering needs, although searing works best above 400ºF. The remaining burners were less impressive. None of them could boil water in under 10 minutes, and they all offered only a narrow range of temperatures. We also noticed very little heat evenness from the burners: Food cooked on the right side or front of a pan tended to get overdone. 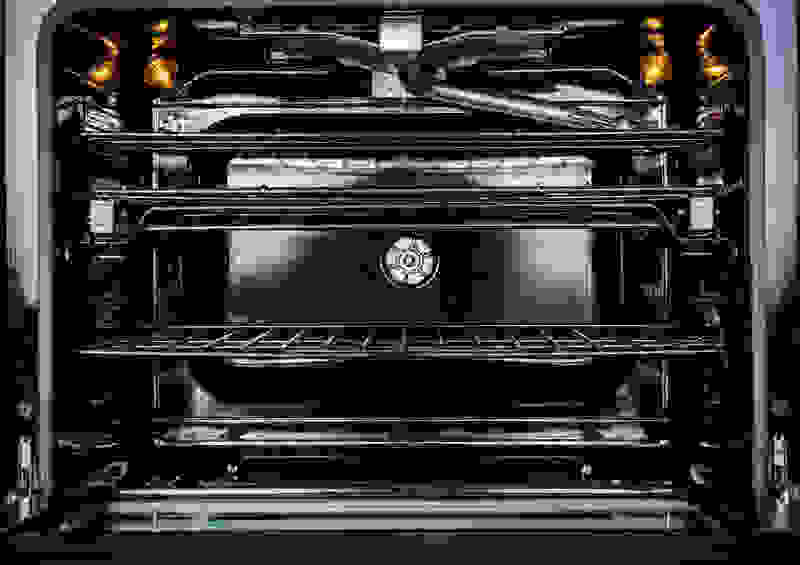 While a good set of burners is always welcome, the true test of a range's mettle is its oven's ability to cook food evenly. In this area, the 72583 did about as well as we expect for a product at a much lower price, with a mix of even and uneven depending on the cooking mode. Surprisingly, when we baked cookies, the standard bake setting resulted in more even results than the true convection setting. There was a noticeable difference between cookies on the outer edges of the baking sheet when compared with those in the center, but not enough to be a problem. The multi-rack convection setting was also less impressive, with food placed on the lower rack faring better than food placed on the upper rack. Up top, we noticed a significant difference between cookies particularly between those in the center and those on the right. While it may seem like we’re painting a dire picture, most of these issues can be mitigated with attentive baking and occasional rotating of food. While the Convection Bake setting had its ups and downs, the Convection Roast setting should be your go-to for legs of lamb and whole chicken. It was by no means exceptional, and we noticed a fair degree of variation in doneness when comparing the left and right sections of our roasts. However, it did a considerably better job at roasting than the standard bake element. Finally, both the broiler and preheat speeds proved disappointing. Food placed under the center rear of the broiler was completely burnt while the food on the left and right remained underdone. Meanwhile, the oven took a sluggish 12 minutes to reach 350°F using the standard bake setting. Convection sped things up considerably: The oven took just under 10 minutes to reach temperature using this setting. While the Kenmore 72583 may suffer from some occasional baking unevenness and a few lousy burners, we would still consider it worth a look based on its design alone. 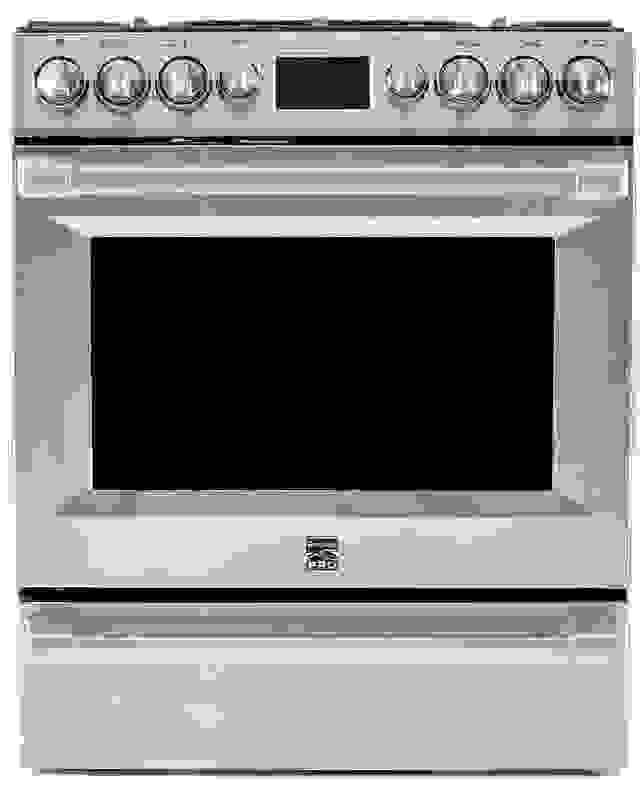 We like the overall Kenmore Pro aesthetic, and think this range fits well with the rest of the suite. If you've always dreamed of kitting out your kitchen in industrial-looking stainless appliances, the 72583 is a good start. Unfortunately, this Kenmore's $1,999 sale price is just too high for us to recommend a range that—under the surface—is merely an average performer.